THE STATUS OF HOLY GRASS (Hierochloë odorata) (L.) P. Beauv. 11 Rosshall Place, Renfrew PA4 0BA. Holy Grass (Hierochloë odorata) is a plant of wet grassy places and tidal river margins. This grass is widespread in Asia, Europe and in North America where it is known as Sweet Grass or Vanilla Grass. In Britain, Holy Grass is listed as a nationally rare plant and is classified as a Red Data Book species (found in fewer than fifteen 10x10km grid squares out of 3,500 in the British Isles). In Scotland Holy Grass has been recorded from twelve localities. Most of these sites are on or near the coast, river estuaries and tidal river margins. Some inland locations have also been discovered. Holy Grass was first identified as a British plant in an Angus glen by Mr George Don in July 1812. Don was an amateur Scottish botanist and his discovery was listed as the Northern Hierochloë. For many years searches were made by enthusiastic botanists at the Angus site but the Holy Grass eluded them. It was not until 1854 that a second station was discovered at Thurso. The plant was now becoming recognised as a Scottish species and, over the years, new localities have been added to the list. The Renfrew site was discovered in the 1930’s. The generic name Hierochloë is derived from the Greek hieros, “sacred”, and chloë, “grass”; hence Holy Grass. The specific name odorata refers to an aroma produced from the plants which some have described as being like vanilla or coumarin. Holy Grass is the first perennial grass to flower, sometimes in March, but more usually in April and May and is most easily identified in springtime. It spreads rapidly by means of slender creeping rhizomes which form compact patches. The genus was called Hierochloë because in some parts of Prussia the plant was dedicated to the Virgin Mary and was strewn around churches at festivals, the sweet scent from the grass no doubt helping to disguise dampness arising from the earthen floors. Linnaeus states that the grass is a soporific and sold in Swedish towns “to be suspended over the beds and induce sleep.” These practices have not, as far as is known, been recorded in Scotland. Many of the Scottish locations are, however, in the vicinity of ancient ecclesiastical sites. Holy Grass was found at Blythswood by J.R. Lee on the 28th April 1931. A notice appeared in the Report of the Botanical Society and Exchange Club of 1931 stating “ Hierochloë borealis. A small patch, well established, was found on the bank of the River Cart, Blythswood, Renfrew, J.R. Lee. The old church of Inchinnan is only half a mile away, and Paisley Abbey is five or six miles distant”. This appears to be the earliest published account of the Holy Grass at Renfrew. It is not listed in The Clydesdale Flora by Hennedy in 1865. Lee’s herbarium sheet records the location as “banks of the Cart at Blythswood” and the plant was named Hierochloë borealis Roem. & Schultz. A further specimen collected by him at the same location is dated 19th May 1932. The herbarium of J.R. Lee is now included in the Glasgow University Herbarium. Dr Donald Patton collected two specimens from the same area in 1933. They are named Hierochloë odorata Wahl. and were collected from the “right bank of Cart below Inchinnan Bridge.” This is probably the site discovered by Lee two years earlier. J.H. Penson of Glasgow took a great interest in the Holy Grass at Blythswood, and between the years 1959 and 1976, he visited the area almost every year. His manuscript notebooks give an interesting and informative account of the flowering success and survival of the Holy Grass during this period. Penson appears to have had knowledge of only two of the three sites known to botanists today. Site 1 NS495680 Located at the rear of the Normandy Hotel, this large patch measures 10 metres long by 1 metre wide. This site is to be found on the east bank of the White Cart beginning at the pathside opposite the remains of a brick-built enclosure formerly used by the hotel for burning rubbish. The plants extend down-river to a small inlet. In March the lime-green grass blades are conspicuous from the public footpath. This population produces few flowerheads and seems to thrive entirely vegetatively. This is probably the second station recorded by Penson in 1969. Site 2 NS495685 Located further downriver, again on the right bank, below the confluence of the White and Black Cart Waters. This site is to be found directly under the flight path of Glasgow Airport. The plants are situated on the riverbank at the pathside across from a large Willow at the edge of Renfrew Golf Course. The colony measures 6 metres long by 2 metres wide. The earliest date for flowerheads was 17th March 2000 when four were observed. This station is believed to be the site discovered by Lee in 1931 and visited later by Penson in the 1960s. It would seem to be much drier than Site 1 due to the exposed situation. Site 3 NS495688 On the left side of the river, downriver from the Cart Waters confluence, are the remains of a once larger island called Colin’s Isle which now consists of a string of three small islands. The larger island, marked as Colin’s Isle on O.S. maps, is densely covered by the Common Reed. Holy Grass may have originally been on this island but succumbed to competition from the Common Reed which probably spread from the nearby riverbank where it is abundant. Two small un-named islets lie further downriver from Colin’s Isle. The first, with a solitary Hawthorn tree at the centre, supports a healthy colony of Holy Grass. This islet, accessible only at low tides, is fully exposed to wind and sunshine. It is not known at present when this station was first discovered or by whom. The second and northern most islet is frequently underwater at high tides and supports only Sea Aster. Thorough searches of the banks upriver on both the White and Black Cart Waters have produced no further patches of Holy Grass. 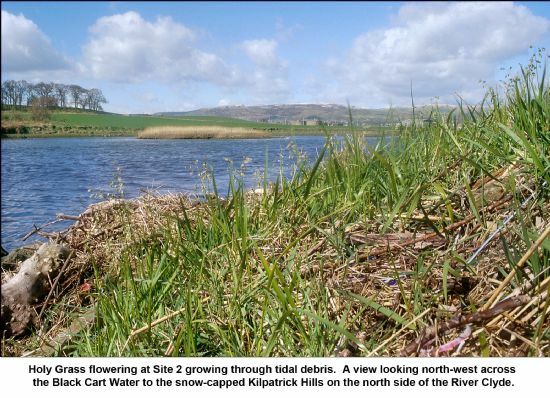 The rivers and land surrounding the Holy Grass sites have undergone dramatic changes over many centuries. In 1796 the White Cart Water was widened, deepened and straightened. A canal cut was made to the east of the former channel so avoiding shallows at the Inchinnan Bridge. This canal allowed larger ships access to docking facilities upriver at Paisley. The present Rolling Lift Bascule Bridge crosses over the former canal section of the White Cart. The Clyde/Cart confluence area was later deepened to permit the launching of large ships from what was formerly known as John Brown shipyards. These various navigation schemes radically changed the topography of the Cart Waters. Less than a mile upriver on the Black Cart Water is the site of the ancient church of Inchinnan. The first structure on the site dated from between 593-612 AD and around 1100AD a stone and lime edifice was erected at the side of the river. A church existed on this site until the 1960s when the building was dismantled and re-located at Inchinnan as part of the development of Glasgow Airport. The fact that Holy Grass is at Renfrew raises the question of how such a rare plant should come to be on the lower reaches of the Cart Waters and why the grass was not discovered until 1933. There would seem to be a number of possibilities - none of which can be substantiated by any facts. The following points may be of interest. a) The lack of records prior to 1933 may be explained by Holy Grass being most conspicuous early in the year. It is often overlooked if searched for in summer. 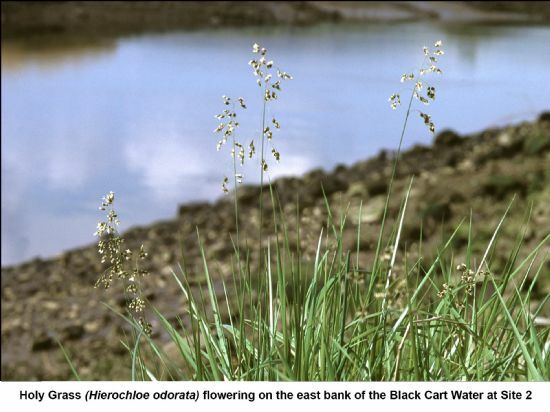 The Holy Grass sites were unknown to Prof Hennedy when he wrote The Clydesdale Flora in 1865. He was known to botanise around Inchinnan. During the nineteenth century, the Blythswood area was strictly private being part of the policies of Blythswood House. Access was by permission only. b) Lee’s suggestion of the plants being introduced from ships’ ballast is an interesting theory. A number of ‘alien’ and unusual plants are to be found on the Cart Water banks, e.g. Hoary Cress (Cardaria draba). Such plants were probably introduced by shipping activities. Local botanists do not seem to favour this idea for the introduction of the Holy Grass. c) In the immediate vicinity of the Holy Grass sites there are three long established churches. The Renfrew Parish Church is situated less than a mile east of the Cart Waters. On the White Cart, a few miles upriver, stands Paisley Abbey and on the Black Cart is the site of the former Inchinnan Church. The close proximity of the Holy Grass sites to these early churches invites the assumption that there could be a connection between the two. However, recent studies of plant remains and pollen found in drains at Paisley Abbey did not include Holy Grass pollen. Is the Holy Grass on the Cart Waters simply a relict population surviving from earlier times when it was grown locally and used, along with other aromatic plants, to freshen the damp, earthen-floored churches in the surrounding area? The author is grateful to John Mitchell, Peter Macpherson and the late Allan Stirling for help with the literature on Hierochloë odorata. Thanks also to Keith Watson, the late Allan Stirling and John Mitchell for additional assistance.